Preheat oven to 160°C (325°F). Place the butter, sugar and vanilla in the bowl of an electric mixer and beat for 4–5 minutes or until light and creamy. Add the eggs, one at a time, beating well after each addition. Add the flour and milk and beat until just combined. Divide the mixture between 3 bowls. Colour one portion with the pink colouring. Add the cocoa to the second bowl and mix to combine. 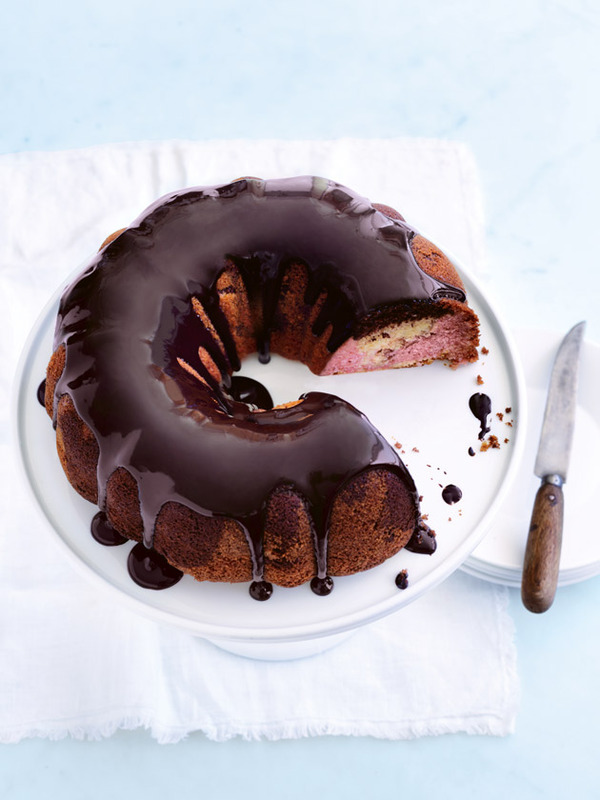 Grease a 3-litre bundt tin and spoon alternate spoonfuls of pink, chocolate and plain cake mixture into the tin. Swirl with a butter knife. Bake for 45–50 minutes or until cooked when tested with a skewer. Place the tin on a wire rack to cool slightly, before turning the cake out to cool completely. To make the chocolate icing, place the icing sugar mixture, cocoa and boiling water in a large bowl and whisk until smooth. Spoon the icing over the cake to serve. Serves 8–10. Tip: To create the perfect swirl, just drag the butter knife through the mixture 2–3 times, otherwise the batter will mix too much together.